Just in! Barca Star Carlers Puyol says Slam Pakistan in the PSL Closing Ceremony at National Stadium Karachi. 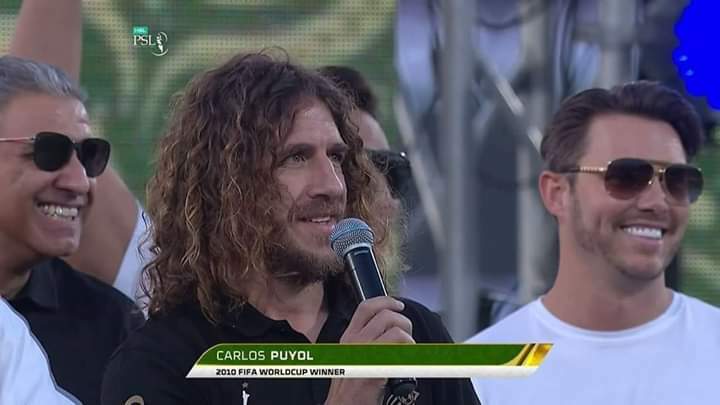 Puyol was there at National Stadium Karachi for the promotion of WSS. While addressing to the pumped audience at National Stadium he Said. Slam Pakistan! I am very happy to be here. It’s my first time here and I am enjoying it a lot. I thought Pakistanis only liked cricket but I have seen they like football a lot also which has made me happy. Thank you Pakistan for warm welcome, thanks for inviting me. People here are so friendly and people outside think they only love cricket but they are football fans here too”. Puyol had arrived in Karachi to promote the World Soccer Stars with his other friends, Ricardo Kaka and Luis Figo. The final match between Quetta Gladiators and Peshawar Zalmi is shortly to begin at National Stadium Karachi.